This article is about the Special Operations Force. For other uses, see Delta Force (disambiguation). 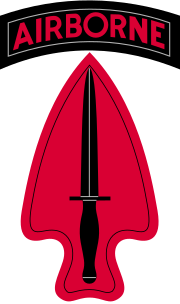 USASOC's shoulder sleeve insignia worn by 1st SFOD-D operators, depicting the historical Fairbairn–Sykes fighting knife inside the outline of an arrowhead. Delta Force was formed after numerous well-publicized terrorist incidents in the 1970s. These incidents led the U.S. government to develop a full-time counterterrorism unit. Key military and government figures had already been briefed on this type of unit in the early 1960s. Charlie Beckwith, a Special Forces (Green Berets) officer and Vietnam War veteran, served as an exchange officer with the British Army's Special Air Service (22 SAS Regiment) during the Malayan Emergency. On his return, Beckwith presented a detailed report highlighting the U.S. Army's vulnerability in not having an SAS-type unit. U.S. Army Special Forces in that period focused on unconventional warfare, but Beckwith recognized the need for "not only teachers, but doers." He envisioned highly adaptable and completely autonomous small teams with a broad array of special skills for direct action and counterterrorist missions. He briefed military and government figures, who were resistant to creating a new unit outside of Special Forces or changing existing methods. Finally, in the mid-70s, as the threat of terrorism grew, the Pentagon and Army senior leadership appointed Beckwith to form the unit. Beckwith estimated that it would take 24 months to get his new unit mission-ready. Beckwith's estimate came from a conversation he had had earlier with Brigadier John Watts while in England in 1976. Watts had made it clear to Beckwith that it would take eighteen months to build a squadron, but advised him to tell the Army leadership that it would take two years, and not to "let anyone talk (him) out of this." To justify why it would take two years to build Delta, Beckwith and his staff drafted what they dubbed the "Robert Redford Paper." In it Delta outlined its necessities and historical precedents for a four-phase selection/assessment process. 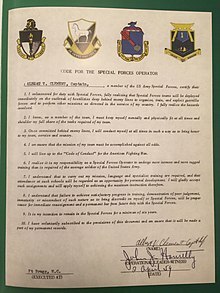 Delta Force was then established on 19 November 1977, by Beckwith and Colonel Thomas Henry. In the meantime, Colonel Bob "Black Gloves" Mountel of the 5th Special Forces Group was tasked with creating a unit "to breach the short-term gap" that existed until Delta was ready, dubbed Blue Light. The initial members of the unit were screened from volunteers and put through a specialized selection process in early 1978, involving a series of land navigation problems in mountainous terrain while carrying increasing weight. The purpose was to test candidates' endurance, stamina, willingness to endure and mental resolve. The first training course lasted from April to September 1978. Delta Force was certified as fully mission capable in Fall 1979 right before the Iran hostage crisis. On 4 November 1979, 53 American diplomats and citizens were taken captive and held in the U.S. embassy in Tehran, Iran. 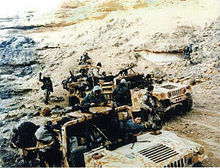 Delta Force was tasked to plan and execute Operation Eagle Claw and recover the hostages from the embassy by force on the nights of 24 and 25 April in 1980. The operation was aborted due to problems with helicopter failures. The review commission that examined the failure found 23 problems with the operation, among them unexpected weather encountered by the aircraft, command-and-control problems between the multi-service component commanders, a collision between a helicopter and a ground-refueling tanker aircraft, and mechanical problems that reduced the number of available helicopters from eight to five (one fewer than the minimum desired) before the mission contingent could leave the trans-loading/refueling site. After the failed operation, the U.S. government realized more changes needed to be made. The 160th Special Operations Aviation Regiment (Airborne), also known as the "Night Stalkers", was created for special operations requiring aviation support. The Navy's SEAL Team Six, an earlier incarnation of the current Naval Special Warfare Development Group, was created for maritime counter-terrorism operations. The Joint Special Operations Command was created for command and control of the various counter-terrorism units of the U.S. military. The unit is under the organization of the US Army Special Operations Command (USASOC) but is controlled by the Joint Special Operations Command (JSOC). Command of 1st SFOD-D is a colonel's billet. Virtually all information about the unit is highly classified and details about specific missions or operations generally are not available publicly. The unit is headquartered at Fort Bragg, North Carolina. Delta Force's structure is similar to the British 22 Special Air Service, the unit that inspired Delta's formation. In Not a Good Day to Die: The Untold Story of Operation Anaconda, Army Times staff writer Sean Naylor describes Delta as having, at the time, nearly 1,000 soldiers, of which approximately 250 to 300 are trained to conduct direct action and hostage rescue operations. The rest are highly specialized support personnel who are among the very best in their fields. Within each sabre squadron there are three troops: two assault troops specializing in direct action and a reconnaissance and surveillance, or "recce", troop, for penetrating enemy lines unseen, watching enemy positions, and sniping. Each squadron is commanded by a Major (O-4) and troops are led by Captains (O-3). Each troop has multiple teams, each one led by a non-commissioned officer, usually a Master Sergeant (E-8) or Sergeant Major (E-9). The rest of these teams are filled out with operators ranging in rank from Sergeant (E-5) to Master Sergeant (E-8). Delta trains with other foreign units with the purpose to improve tactics and increase relationships and exchanges with international special operations communities. Since the 1990s, the Army has posted recruitment notices for the 1st SFOD-D. The Army, however, has never released an official fact sheet for the elite force. The recruitment notices in Fort Bragg's newspaper, Paraglide, refer to Delta Force by name, and label it "...the U.S. Army's special operations unit organized for the conduct of missions requiring rapid response with surgical application of a wide variety of unique special operations skills...". The notice states that applicants must be male, in the grade of E-4 through E-8, have at least two and a half years of service remaining in their enlistment, be 21 years or older, and score high enough on the Armed Services Vocational Aptitude Battery to attend a briefing to be considered for admission. Candidates must be airborne qualified or volunteer for airborne training. Officer candidates need to be O-3 captains or O-4 majors. All candidates must be eligible for a security clearance level of "Secret" and have not been convicted by court-martial or have disciplinary action noted in their official military personnel file under the provisions of Article 15 of the Uniform Code of Military Justice. On 29 June 2006 during a session of the Committee on Armed Services, General Wayne Downing testified before the U.S. House of Representatives that 70 percent of all Delta operators had served in the 75th Ranger Regiment. Eric Haney's book Inside Delta Force described the selection course and its inception in detail. Haney wrote that the selection course began with standard tests including push-ups, sit-ups, and a 2-mile (3.2 km) run, an inverted crawl and a 100-meter swim fully dressed. The candidates are then put through a series of land navigation courses to include an 18-mile (29 km) all-night land navigation course while carrying a 40-pound (18 kg) rucksack. The rucksack's weight and the distance of the courses are increased and the time standards to complete the task are shortened with every march. The physical testing ended with a 40-mile (64 km) march with a 45-pound (20 kg) rucksack over rough terrain that had to be completed in an unknown amount of time. Haney wrote that only the senior officer and NCO in charge of selection are allowed to see the set time limits, but all assessment and selection tasks and conditions were set by Delta training cadre. The mental portion of the testing began with numerous psychological exams. The men then went in front of a board of Delta instructors, unit psychologists, and the Delta commander, who each ask the candidate a barrage of questions and then dissect every response and mannerism of the candidate with the purpose of mentally exhausting the candidate. The unit commander then approaches the candidate and tells him if he has been selected. If an individual is selected for Delta, he undergoes an intense 6-month Operator Training Course (OTC), to learn counter-terrorism and counterintelligence techniques, in which the individual maintains little contact with friends and family for the duration. Training includes firearm accuracy and various other weapons training. In an interview, former Delta operator Paul Howe talked about the high attrition rate of the Delta selection course. He said that out of his two classes of 120 applicants each, 12 to 14 completed the selection. The Central Intelligence Agency's highly secretive Special Activities Division (SAD) and more specifically its elite Special Operations Group (SOG), often works with – and recruits – operators from Delta Force. The trainees shoot without aiming at stationary targets at close range until they gain almost complete accuracy, then progress to moving targets. Once these shooting skills are perfected, trainees move to a shooting house and clear rooms of "enemy" targets – first one only, then two at a time, three, and finally four. When all can demonstrate sufficient skill, "hostages" are added to the mix. Trainees learn how to pick many different locks, including those on cars and safes. Advanced demolition, and bomb making using common materials. Combined skills. The FBI, FAA, and other agencies were used to advise the training of this portion of OTC. The new Delta operators use demolition and marksmanship at the shoothouse and other training facilities to train for hostage and counter-terrorist operations with assault and sniper troops working together. They practice terrorist or hostage situations in buildings, aircraft, and other settings. All trainees learn how to set sniper positions around a building containing hostages. They learn the proper ways to set up a TOC and communicate in an organized manner. Although Delta has specialized sniper troops, all members go through this training. The students then go back to the shoothouse and the "hostages" are replaced with other students and Delta Force members. Live ammunition is known to have been used in these exercises, to test the students, and build trust between one another. Tradecraft. During the first OTCs and creation of Delta, CIA personnel were used to teach this portion. Students learn different espionage-related skills, such as dead drops, brief encounters, pickups, load and unload signals, danger and safe signals, surveillance and counter-surveillance. Executive Protection. During the first OTCs and creation of Delta, the U.S. State Department's Diplomatic Security Service and the United States Secret Service advised Delta. Students take an advanced driving course learning how to use a vehicle or many vehicles as defensive and offensive weapons. They then learn techniques for VIP and diplomatic protection developed by the Secret Service and DSS. A final test requires the students to apply and dynamically adapt all of the skills that they have learned. The Department of Defense tightly controls information about Delta Force and refuses to comment publicly on the highly secretive unit and its activities; usually unless the unit is part of a major operation or a unit member has been killed. Delta operators are granted an enormous amount of flexibility and autonomy during military operations overseas. To conceal their identities, soldiers rarely wear a uniform and usually wear civilian clothing both on and off duty. When military uniforms are worn, they lack markings, surnames, or branch names. Civilian hair styles and facial hair are allowed to enable the members to blend in and avoid recognition as military personnel. Their Navy counterpart DEVGRU is also granted the same amount of autonomy and flexibility. The majority of the operations assigned to Delta are classified and may never be known to the public. However, details of some operations have become public knowledge. For service during Operation Urgent Fury, Delta was awarded the Joint Meritorious Unit Award. The unit was awarded the Valorous Unit Award for extraordinary heroism during the Modelo Prison Hostage Rescue Mission and the capture of Manuel Noriega in December 1989 during Operation Just Cause in Panama. During Operation Iraqi Freedom and Operation Enduring Freedom, the 1st SFOD-D was awarded the Presidential Unit Citation for combat operations in Afghanistan from 4 October 2001 to 15 March 2002 and Iraq from 19 March 2003 to 13 December 2003. ^ a b c d e f g Haney, Eric L. (2002). Inside Delta Force. New York: Delacorte Press. p. 325. ISBN 978-0-385-33603-1. ^ "US-Iraqi rescue operation 'foils IS mass execution'". BBC News. 22 October 2015. ^ Jack Murphy (11 January 2016). "JSOC's Secretive Delta Force Operators on the Ground for El Chapo Capture". SOFREP News. Retrieved 18 March 2016. ^ "Special Operations/Delta Force". military.com. Retrieved 3 March 2018. ^ "5 key differences between Delta Force and SEAL Team 6". www.wearethemighty.com. Retrieved 25 June 2018. ^ Beckwith, Charlie (2000) . Delta Force: The Army's Elite Counterterrorist Unit (Paperback ed.). Avon Books. p. 39. ISBN 978-0-380-80939-4. ^ Goolsby, Denise (14 July 2016). "Palm Springs man was Army Delta Force co-creator". The Desert Sun. Palm Springs, Cal. ^ Gabriel, Richard A. (1985). Military Incompetence: Why the American Military Doesn't Win. Hill and Wang. pp. 106–16. ISBN 978-0-374-52137-0. Overall, the Holloway Commission blamed the ad hoc nature of the task force and an excessive degree of security, both of which intensified command-and-control problems. ^ a b Naylor, Sean (2006). Not a Good Day to Die: The Untold Story of Operation Anaconda. Berkeley: Berkley Books. ISBN 978-0-425-19609-0. ^ Naylor, Sean (2015). Relentless Strike: The Secret History of Joint Special Operations Command. St. Martin's Press. p. 57. ISBN 9781466876224. ^ Naylor, Sean (2015). Relentless Strike: The Secret History of Joint Special Operations Command. St. Martin's Press. p. 454. ISBN 9781466876224. ^ "News Briefs". 10 February 2011. . Fort Campbell, Kentucky: Fort Campbell Courier (publication). Retrieved 3 July 2018. ^ Mountaineer. SFOD-D seeking new members Archived 17 January 2004 at the Wayback Machine. Fort Carson, Colorado: Mountaineer (publication). 16 January 2003. ^ "Fort Bragg's newspaper Paraglide, recruitment notice for Delta Force". Archived from the original on 11 June 2009. Retrieved 17 November 2009. ^ "Assessing U.S. Special Operations Command's Missions and Roles" (PDF). Federation of American Scientists. Retrieved 11 August 2012. ^ Beckwith, Charlie A. (1983). Delta Force. San Diego: Harcourt. ISBN 978-0-15-124657-1. ^ "Delta Force Tryouts". Retrieved 18 February 2014 – via YouTube. ^ a b Bowden, Mark (1999). Black Hawk Down: A Story of Modern War. Berkeley: Atlantic Monthly Press. ISBN 978-0-87113-738-8. ^ Waller, Douglas (3 February 2003). "The CIA's Secret Army: The CIA's Secret Army". Time. Retrieved 6 December 2015. ^ Charles H. Briscoe. "The Special Forces Operator 1959". Veritas: Journal of Army Special Operations History (V14/N1), pp. 63-64. Boykin, William (2011). Never Surrender: A Soldier's Journey to the Crossroads of Faith and Freedom. FaithWords; Reprint edition. ISBN 0446583227. Bowden, Mark (2001). Killing Pablo: The Hunt for the World's Greatest Outlaw. New York: Atlantic Monthly Press. ISBN 0-87113-783-6. About the hunt for Pablo Escobar. Bowden, Mark (2006). Guests of the Ayatollah: The First Battle in America's War with Militant Islam. New York: Atlantic Monthly Press. ISBN 978-0-87113-925-2. OCLC 62738726. Bowden, Mark (May 2006). "The Desert One Debacle". The Atlantic Monthly. Fury, Dalton (2009). Kill Bin Laden: A Delta Force Commander's Account of the Hunt for the World's Most Wanted Man. New York: St. Martin's Griffin. ISBN 978-0-312-56740-8. OCLC 317455875. Griswold, Terry, and D. M. Giangreco (2002). DELTA: America's Elite Counterterrorist Force. Osceola, WI: Motorbooks International. ISBN 0-87938-615-0. OCLC 25549191. National Geographic documentary: Road to Baghdad. Pushies, Fred J., et al. (2002). U.S. Counter-Terrorist Forces. St. Paul, Minn.: MBI Publishing Company. ISBN 0-7603-1363-6. OCLC 49391516. Schauer, Hartmut (2008). Delta Force. Stuttgart: Motorbuch Verlag. ISBN 978-3-613-02958-3. Smith, Michael (2007). Killer Elite: America's Most Secret Special Operations Team. New York: St. Martin's Press. ISBN 0-312-36272-2. About Delta cooperation with the Intelligence Support Activity. Wikimedia Commons has media related to 1st Special Forces Operational Detachment-Delta (Airborne).